The second outing for the talented detective team of Aelred Barling, royal clerk to Henry II, and his assistant Hugo Stanton is full of chilling atmosphere, both literal and figurative. At the request of Ranulf de Glanville, Justiciar of England in 1177 AD, both are sent north from London, a ten days’ ride in darkest winter, to the remote Cistercian house of Fairmore Abbey in Yorkshire. On Christmas Eve, the mild-mannered sacrist, Brother Cuthbert, was found murdered in a pretty horrific way. Abbot Philip, who’d known Barling during their youthful studies in Paris, requests his help specifically. While Stanton’s an easygoing sort who enjoys ale, convivial gatherings, and women, Barling is a straitlaced fellow who prefers time at his writing desk. When it comes to their feelings about this mission, though, they’re in agreement: neither wants to go. When they arrive at the monastery, which is nestled deep into a rocky valley, they discover the place in turmoil, although few openly admit it. Tension spills out from multiple avenues. The older monks chafe at Philip’s election to his current role, the lay brothers resent being treated like mindless workhorses, and many feel uncomfortable breaking their vows of silence to respond to outsiders’ questions. Then a second murder occurs, and another. Each is creatively gruesome. This strongly plotted mystery is definitely not a cozy! The thawing relationship between Barling and Stanton, already begun after their joint success in The King’s Justice, helps lighten their increasingly heavy investigative burden. Barling sees it as his duty to impart periodic lessons that Stanton hates, but they acknowledge the other’s strengths and gifts. The final outcome, which arrives after a high body count, depends on their bond of mutual trust and is gratifying in that sense, and others. The cast list isn’t solely male, and the presence of women in this highly regulated masculine environment creates disarray that’s first entertaining, and later dangerous. Hints at secrets about Barling’s past, which he’d rather not think about, contribute another intrigue-filled layer. Sometimes later volumes in a mystery series reveal the truth about earlier whodunits, but fortunately this isn't the case here. Readers who haven’t picked up book one, which I also recommend, won't discover any clues about how that mystery was resolved. 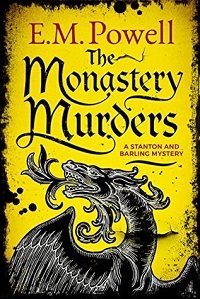 The Monastery Murders is published by Thomas & Mercer, Amazon's crime/thriller imprint, in September. Thanks to the author (who I'd interviewed about book one, The King's Justice) for sending me a NetGalley widget. This prompts me to dip my toe into the 12th century. I'm usually stuck in the 1800 and 1900s. Time to venture forth! Thanks for the recommdation. Enjoy! The 12th century is a pretty happening place - these murders aside, there was a lot of drama during Henry II's reign. Reading this novel makes me glad I live nowadays. Dealing with winter back then (especially in Yorkshire) must not have been fun.